Amethistle: Creativity for the Fun of It! : When Is One Color More than One Color? 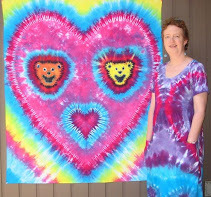 One of the things about Procion dyes for tie-dye is that they are usually made up of other colors of dye. Sometimes they separate or bleed into their component colors, producing an outer halo effect at the edges of the dyed area (similar to chromatography experiments I did in school). Not all colors do this, and the ones that do separate don't do it all the time. Most professional tie-dyers use thickener with their dyes. This especially applies to the dyers that mass produce tie-dye for wholesale and silkscreening. The thickener primarily keeps the dyes from spreading too fast, and it prevents them from blending much with the adjoining colors, but it also stops the separation or bleeding. In fact, one way I can easily spot a "store-bought" shirt is by looking at how much bleeding or blending the shirt has. If there isn't any, it's probably store-bought. The other thing I look for is the density of color. Store-bought shirts usually have very little or no white on them--it's all perfectly colored. It's useful to create a color sampler with the colors of dye you're using (as Dharma says, "test, test, TEST!"). If you do it without thickener, you can get an idea of what separates and what doesn't. Here on my test T-shirt (T-shirts are cheap! ), I found that a mixture of fuchsia and lemon yellow gave a great yellow halo, and chocolate brown bled bluish, for example. Once you know the bleeding properties of a color or mixture, you can plan to use that feature to good effect. My favorite bleeding colors are the purples, such as Dharma's "blue violet", which usually produce a pretty blue edge. Here I've colored this entire shibori shirt in blue violet. I didn't add any blue, but the blue seeped under the clamps I used to create the resist pattern and gave me that beautiful halo effect. This is one of my favorite shirt designs.